Savannah McCord is the 2015 Lincoln Academy of Illinois student laureate for Southern Illinois University Carbondale. McCord, of St. Louis, is set to graduate with a double major in management and psychology in May 2016. She will be honored with the Abraham Lincoln Civic Engagement Award, which comes with a medallion, certificate of achievement and monetary award, during the annual Student Laureate Convocation on Nov. 7 in the Old State Capital in Springfield. The Lincoln Academy of Illinois presents the award annually to a senior from each of the state’s four-year, degree-granting institutions of higher learning and this marks the 41st year for the awards. “Ms. McCord is the best example of a Saluki. She sets the highest standards of character, dedication and accomplishment to which we want all of our students to strive,” Jason Greene, interim dean of the College of Business and Henry J. Rehn Professor of Finance, wrote in a letter nominating McCord for the award. McCord is remarkable in that she is not only earning a management degree in the College of Business and a psychology degree in the College of Liberal Arts simultaneously, but in so doing, has “excelled in both areas by engaging in research projects in psychology and earning the highest recognition in her business studies,” Greene said. A University Honors Program scholar, McCord is a founding member of the campus chapter of the philanthropic sorority Delta Phi Epsilon, a feature twirler for the Marching Salukis and a resident assistant for University Housing. She served an internship with the Women’s Resource Center and also worked as a research assistant for University Housing and with the Southern Illinois Twins and Siblings Study. She earned the College of Business Most Outstanding Student award in April and for each of the past two years McCord earned the Most Outstanding Senior Award from the management department. 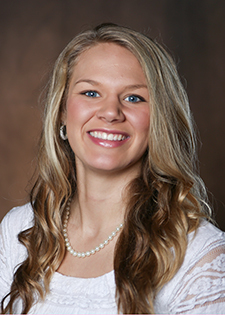 McCord had achieved senior status by her third year at SIU because she had completed a number of dual high school/college credit classes while attending Mehlville High School in St. Louis. She is also the recipient of the Caterpillar Excellence Scholarship and the Hanes Scholarship and was recognized among the top five percent of students by the SIU psychology department. In addition, she served as chairwoman for “It’s On Us,” a campus and community effort to end violence and sexual assault. McCord was excited to learn she was SIU’s 2015 recipient through an email from Interim Chancellor Brad Colwell, she said. After graduation, McCord plans to seek a position in human resources and is considering law school or going on to earn her master’s degree in business administration. She will be accompanied to the ceremony in Springfield by her parents, Ross McCord of St. Louis and Laura Kennedy of High Point, N.C.